This week the National Coalition for the Homeless (a group on whose board I sat on for several years) and the National Law Center on Homelessness and Poverty released a report listing the 20 "meanest cities" to those experiencing homelessness. The report focuses on specific city measures from 2005 that have targeted homeless persons, such as laws that make it illegal to sleep, eat, or sit in public spaces. The report includes information on about 224 cities nationwide. One of the least reported on issues related to homelessness is violence perpetrated against people living on the streets. The issue, however, flashed vividly across television screens and web browsers today. FORT LAUDERDALE, Florida (AP) -- Assailants armed with baseball bats or sticks beat three homeless men in separate attacks Thursday, killing one of the victims, police said. One of the attacks was caught on a university surveillance video. Police said the attacks may be related but they aren't yet sure. Two to four young white males were involved, police said. Officials released the surveillance video from Florida Atlantic University. 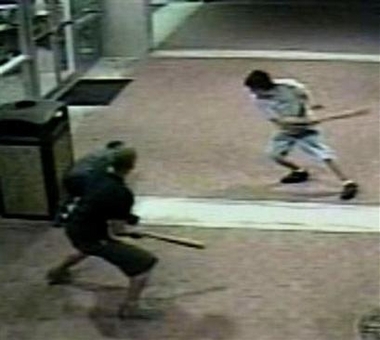 It shows two men beating one of the victims with what appear to be bats. Norris Gaynor, 45, died of his injuries, and the other two men were in serious condition at Broward General Medical Center, police said. The survivors were not identified. You can watch the video on CNN.com. The National Coalition for the Homeless has tracked 156 murders of people who are homeless over the last six years. The number of deaths has increased 67% since 2002.